Text Prediction has been a feature of Android and Apple tablets for a long time. It saves time and automatically corrects spelling errors. For a while now, Windows 10 has also offered text prediction, but it was limited to the onscreen keyboard (software keyboard) that is mostly used on Windows 10 tablets. 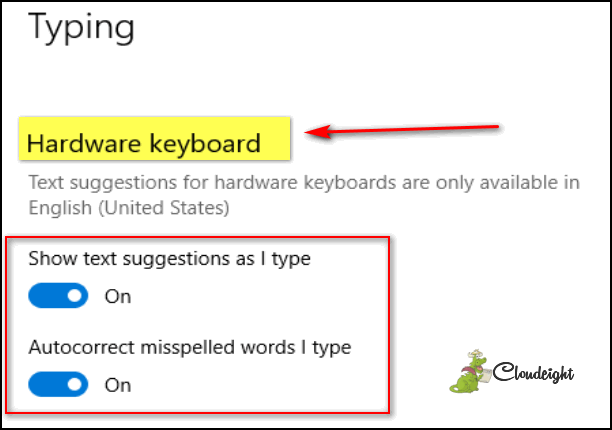 In Windows 10 Version 1803 (April 2018 Update), Microsoft enables Text Prediction for users of desktop and laptops who mainly use the hardware (standard) keyboard. 2] In Settings click on Devices. 3] On the menu on the left click “Typing”. Text Prediction works on any Windows 10 App – Edge, Notepad, WordPad, etc. But woe! It does not work on any 3rd-party apps, like Chrome, Open Office, and so on. Much like its older brothers (sisters?) on Android and Apple devices, as soon as you start typing you will see suggestions pop up. You can choose one of the suggestions by selecting it with the arrow keys – Up/Down/Right/Left. Above: Text Prediction in action. To find out what version of Windows 10 you’re using, type WINVER in the taskbar search and press Enter. Great tip for us older folks who like to spell things like they sound.